Inflatables are a significant investment, both financially and for the livelihood of your business, and should be cared for as such. A few simple care and maintenance steps will keep your inflatables in tip-top form and damage free. To prevent your inflatable from becoming a host for bacteria and germs you must clean and sanitize it thoroughly after each use. After an event, while the inflatable is still inflated, do a walk through removing any loose debris and trash. Once this has been picked up, sweep out the unit, the pillars and the netting. After all of the debris has been removed the unit is now ready to be sanitized. There are many products on the market for this. One very good product frequently used on gymnastics and wrestling mats is Matt-Kleen. This is a very powerful product sold in concentration by the gallon. Follow the instructions to mix the sanitizing product that you have selected and spray down the inflatable, pillars and bounce floor completely. This entire cleaning process will take only about fifteen minutes and will make sure that your products and your company maintains a clean reputation. Clean, presentable inflatables are a critical aspect to your business’ success. In addition to removing debris and dirt, always do a check through the inflatable after every event searching for any damage, tears or punctures. If your inflatable does develop a tear or puncture this is repairable, but should be attended to as soon as possible. You first need to clean the damaged area thoroughly using rubbing alcohol and wait for this to dry. For those inflatables with visible cross-weaving the tear can often be sewn up using a strong, industrial thread. If the material is smooth you will need to patch the area. Many inflatables manufacturers include a patch kit with your purchase. This way the colors will match and the patch will not stand out. If you do not have this you can purchase a wet/dry vinyl repair kit. These can be purchased at any pool supply store. Cut a circular patch a little larger than the tear or puncture. Apply a thin layer of the provided vinyl repair glue to the area around the damage on the inflatable. Apply the same glue to the back of the patch. Place the patch over the damaged area and smooth it over. Let the area dry for at least two hours before using or deflating the inflatable. Keeping your inflatables maintained properly and repaired when necessarily will significantly increase their life span and present your business as a professional, high quality company. The steps are simple and take little effort and should be added to your procedure and process for each event. Have you ever gone to a party that caters to both adults and children during the summer months? Many of these parties all have the same thing: an inflatable slide. But what is an inflatable slide, really? 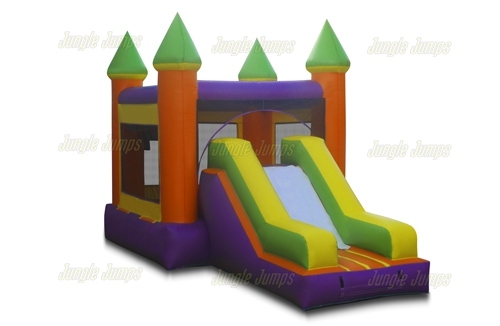 An inflatable slide is actually a very simple concept – it’s a large piece of vinyl that is shaped into a slide-like structure, with a way to climb to the top as well. 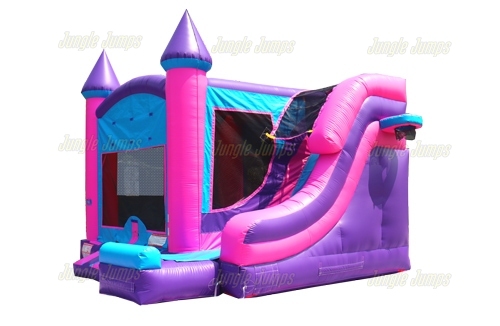 It’s filled using strong blowers that constantly keep the slide filled with air, so that the fun can go on the entire time that people are at the party. 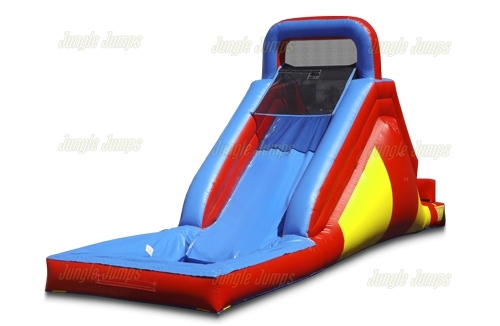 If you’ve ever visited an inflatable slide manufacturer website and have thought about running a rental business, then this article can definitely help you. There are really only three steps that you need to follow to start an inflatable rental business. Before you do anything else you need to uncover knowledge. What type of knowledge do you need? You need knowledge about a number of things, including what the demand for these types of products is in your area (which can be determined by figuring out how many rental businesses are in your area), how the products work, and how much insurance coverage is as well as what it covers. Many people find that in visiting an inflatable manufacturer website they’re able to learn everything that they need to know about how inflatable products work, which is definitely a good place to start. In order to begin an inflatable business you need to actually have inflatable products, which means that you need to visit an inflatable manufacturer business or website in order to purchase them. Inflatable products are actually decently affordable, but when you’re buying two or three, the price can rise a bit. If you don’t have the amount available in ready cash, you have two options: to wait and to borrow. If you opt to wait and save your money, you may find that within a year or so you’re more than able to afford to purchase the type of inflatable products that you want to rent out. If you choose to borrow, there are a number of places where you can get a loan to do so. Some even use a credit card to help them to pay for their initial investment. People aren’t going to realize that you’re offering inflatable products to rent unless you advertise. Advertising doesn’t have to be expensive, and, in fact, you can actually get a great deal of clients simply by using social media sites to help you. If you’re someone who has been looking forward to owning your own business, an inflatable rental company may be the perfect opportunity for you. A competitive price is critical to any business, including the inflatable industry. If your competitors are continuously undercutting your rental prices then you will lose business. Many customers shop by price alone. While you may be able to win and retain customers based on the variety of inflatable products, add-ons you offer and your customer service, you will lose those customers that are only focused on price. If this is something that you are comfortable with, then you may not need to offer any types of discounts. You will always have some customers who are continuously trying to haggle with you over your prices. Determine beforehand how flexible the pricing of your services are and what you can afford to do. Keep in mind that your time is worth money too! Don’t be afraid to say no, even if it means losing a potential client. If the price they are looking for simply falls below realistic expectations and is way out of the ballpark for what other inflatable businesses are pricing, it may be time to cut that particular customer loose. In the end these customers tend to always be looking for more, and are a tremendous time and resource sink as well. Some companies may choose to match the pricing of their competitors. We see this a lot in the retail world. However, this can be a very dangerous practice for inflatable businesses, particularly if you are a small, family owned company. The larger inflatable businesses with more cash flow may try to continuously drive the price down, eliminating their profits or actually causing them to lose money, in an effort to drive you out of business. This is a risky practice for inflatable businesses to get into. Another risk you take when offering discounts to customers is word of mouth. Because much of the inflatable business is sales generated by word of mouth, your pricing will also likely be discussed. Potential customers that hear one customer received a lower price will want the same discounted price, or worse will think you are trying to rip them off when you price them your standard (higher) price. A better business approach to win over the customer who is always trying to bargain shop is to offer them add-ons to go with the inflatable products they are renting. From popcorn machines, to snow cone and cotton candy machines; a bargain shopper who feels like they are getting something for nothing will go away feeling happy and as if they “won”. Assuming that you have these products in your inventory there is no additional cost for throwing these “freebies” in with your customer’s order. If you do decide to offer discounts do so wisely and don’t rule out other bargaining techniques with your price-sensitive customers.